My Mom had surgery on her wrist this morning. Last Thursday night, a skater she was working with accidentally slew-footed her and she crashed awkwardly to the ice. The fall severely broke her wrist in a couple of places. 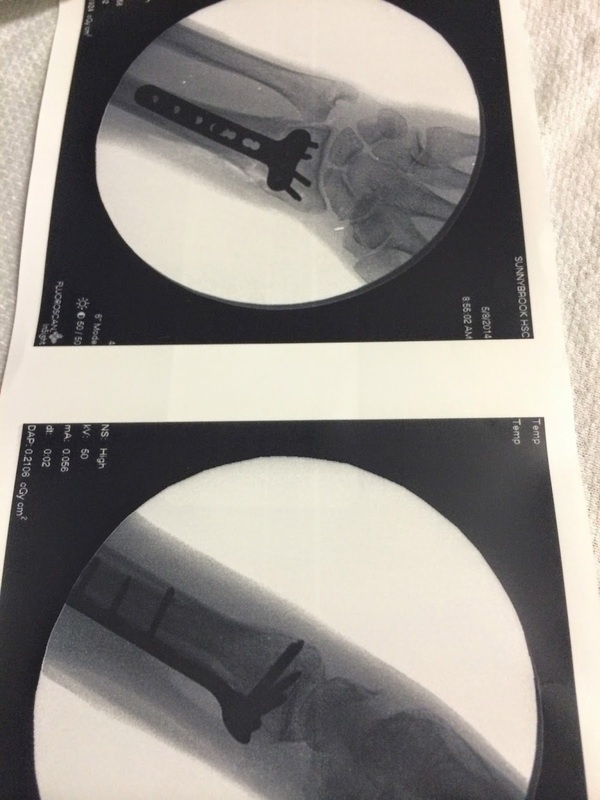 During the operation, the surgeon made sure all the bones were put in place and, my mother is now the proud owner of an awesome fork-like metal plate in her lower arm. My Mom was hoping that they'd give her the post-surgery x-ray. I asked and received a strange look with a "uhhh, I don't think so?" as the response. The nurse then thought that I was a little nuts for asking to take a photo of the x-ray. My mom and I think alike. How could you not want a copy of this?! 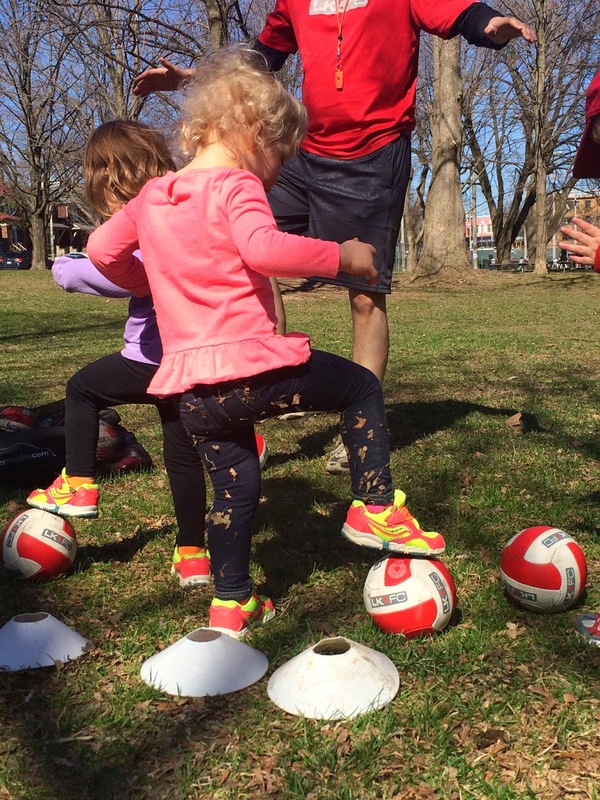 In other news, the girls started soccer class a few weeks ago. Due to a freak late-April snowstorm and a torrential rain storm, they've only gone twice so far. 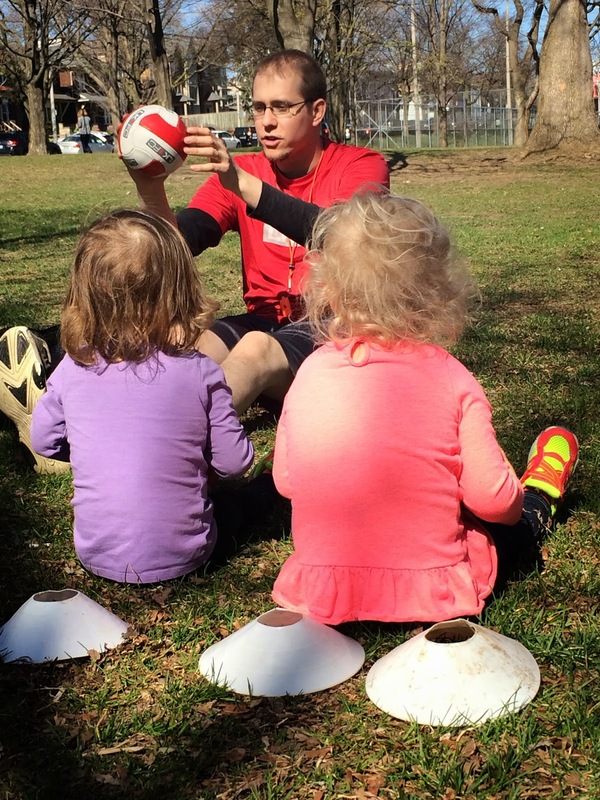 The guy who runs their class is fantastic with the little ones. He changes up the activities every few minutes and keeps them engaged and moving. I've been very impressed with the girls listening skills and their ability to follow instructions. Quinn is proving to be quite coordinated, impressively dribbling the ball. 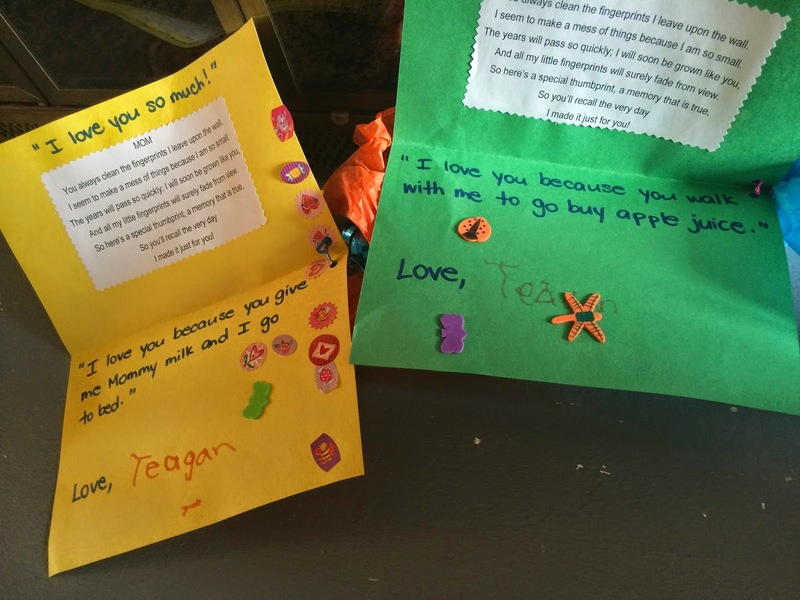 When I picked the girls up at school today, I was handed four handmade cards. 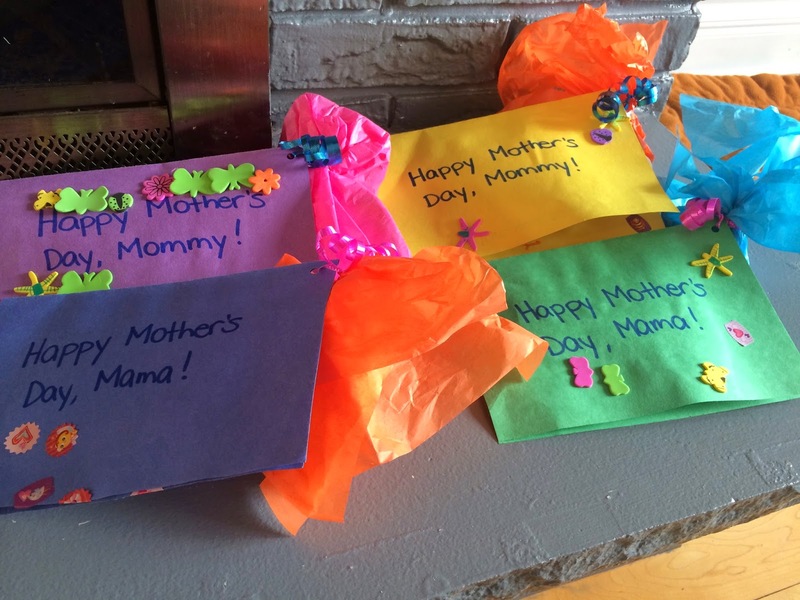 When you have two moms, this is a busy time of year ;) The girls promptly snatched the cards and gifts back wanting to hold them and inevitably open them. Quinny has proven to be quite helpful since she started walking. I didn't compare her to a Border Collie for nothing. In the last few months, she has started asking constantly if she can help me in the kitchen. Mealtime is usually a bit chaotic. At lunchtime, we are rushing home. They're often hungry and tired. At dinnertime, it is much of the same. A few months ago, I would dismiss her requests to help (and feel bad about it). During those hectic mealtimes, I felt that getting the meal on the table as fast as possible was priority number one. Then she started being more persistent. (No clue where she gets it from!) I made the decision to rarely say no to her offers of help. On most days, I now have my sous-chef next to me, propped up on a small chair. On the weekend, she chopped veggies and apples for a salad. 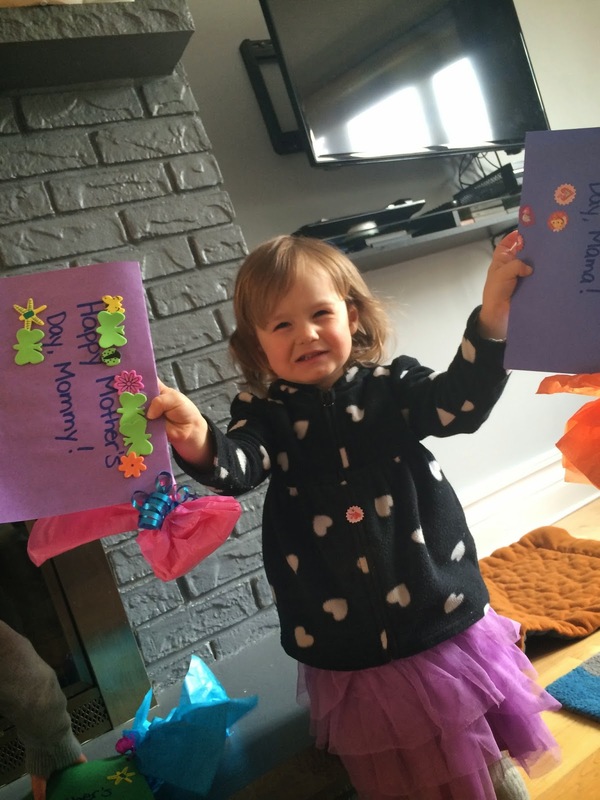 It proved to be difficult with her horribly dull kiddie knife, but she didn't mind. 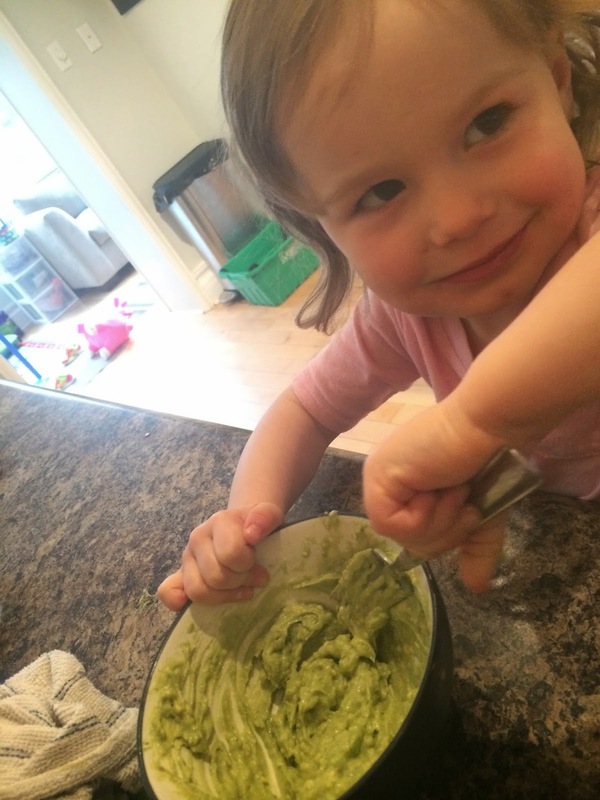 Here she is happily making guacamole. 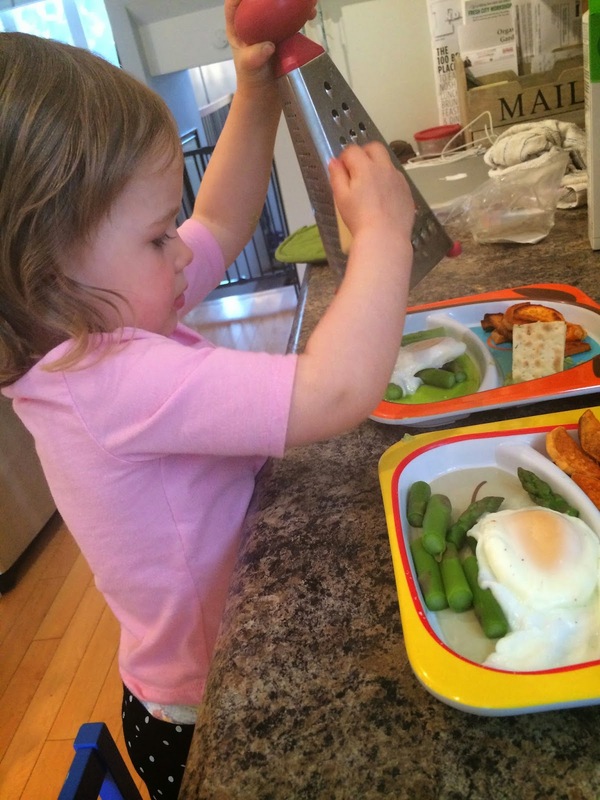 Below that she is very focused while grating Cheddar onto poached eggs and asparagus. Jenn and I got away for a night on the weekend courtesy of the most amazing babysitters in the world, Rob and Kelly. We were both feeling a little burnt out, needing a bit of space from our little cherubs. We went down to Niagara-on-the-Lake and stayed at the Pillar and Post. This is proving to be the perfect location for a quick getaway from Toronto. There are some beautiful inns and B&Bs and great restaurants. There are shops, wineries and great trails along the lake. We had a fantastic meal and had a great time recharging. While walking around on Saturday, I commented on a couple who were there with their three very young children. "Not everyone has a Rob and Kelly," Jenn said. So true. So, to Rob and Kelly, when your triplets arrive, we will be your "Rob and Kelly". 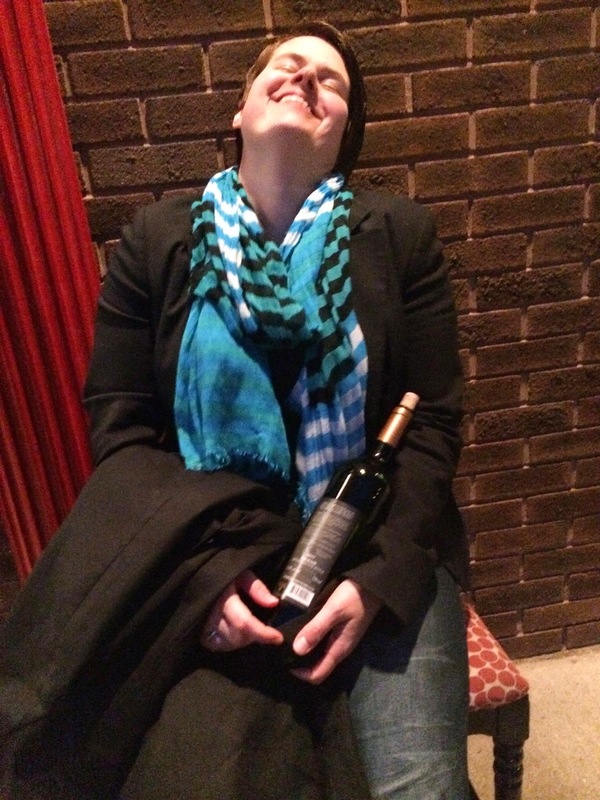 Just kidding…she's going to kill me. That photo and this one were staged. 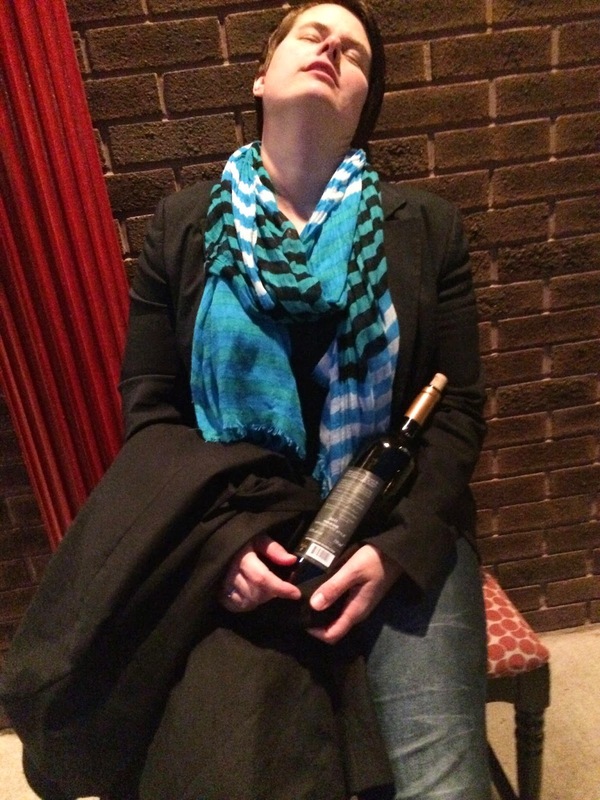 She drank responsibly. 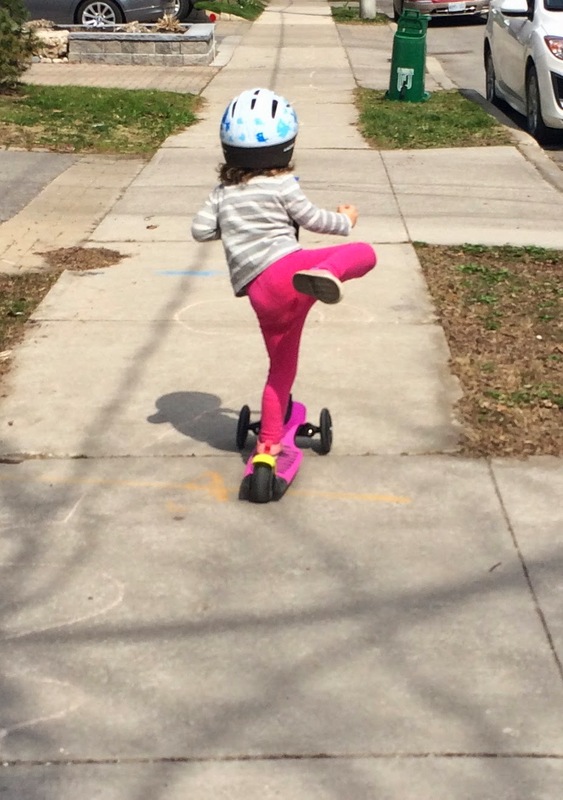 The spring weather seems to have finally arrived in Toronto. The girls and I are loving the outdoor time. They can spend ages flying around on their scooters. I'd want the x-ray too. Why not? I took pics of Quinn's leg x-rays when he broke his leg. I'm from St. Catharines so NOTL (Niagara-on-the-Lake) was my backyard pretty much. We'd go as a family for tea, window shopping and then wading in the pool in the park while listening to music. It's beautiful. Which wineries did you visit? I love Inniskillin (reisling) and Konzelmann.